This wedge in the Himalaya, is situated at an altitude of 5,160 m. Our Langtang trek takes you over this pass as you make your way south from Langtang village, which lies at 3500m and where the national park headquarters is located. The route from Kyangjin Gompa to Helambu, requires crossing the 5,160 m Ganja La. The pass is blocked by snow in the winter, so local inquiries about its condition, good equipment and mountaineering experience are necessary for safe crossing. The Helambu village exceeds a Tibetan feel and you will see fields enclosed by stonewalls as herds of yaks, the most important animal for the people here. From Tarke Gyang, we descend to Melamchi Khola before climbing to Pati Bhyanjyang, then trek down to Sundarijal, from here we drive back to Kathmandu. Day 02: Katmandú – Sight seeing. 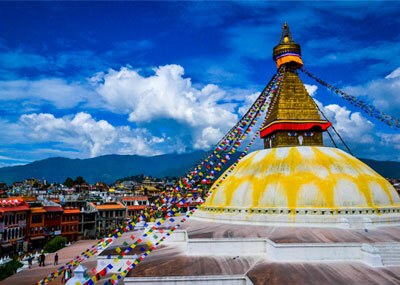 Day 03: Kathmandu – Dhunche 1.950 m by bus. Day 04: Dhunche – Syabru Village 2.130 m trekking and overnight at teahouse. Day 05: Syabru Village – Lama Hotel 2.390 m trekking and overnight at teahouse. Day 06: Lama Hotel – Langtang 3.307 m trekking and overnight at teahouse. Day 07: Langtang – Kyangjin Gompa 3.749 m. trekking and overnight at teahouse. Day 08: Kyangjin Gompa – Ascensión de Tserko Ri 5.028 m. overnight at teahouse. Day 09: Kyangjin Gompa - Ngegang 4.100 m trekking and overnight at teahouse. Day 10: Ngegang – Ganga La 5.121 m. – Keldang 4.300 m. trekking and overnight. Day 11: Keldang – Dukpu 4.020 m. trekking and overnight. Day 12: Dukpu – Tarke Ghyang 2.560 m. trekking and overnight at teahouse. Day 13: Tarke Ghyang - Sermathang 2.620 m. trekking and overnight at teahouse. Day 14: Sermathang – Melamchi Pul 890 m. trekking and overnight at teahouse. Day 15: Melamchi Pul – Kathmandu by bus. Day 17: Kathmandu – Free day in Kathmandu.